Celebrate your heritage by infusing Latin spices into traditional pasta dishes. Whether you love mole, sofrito, or chimichurri, get creative, let pasta be your blank canvas, and add your own personal touch. Looking for a fun dish for Friendsgiving? Add a new twist to chips and guac by frying lasagna strips or bowties to create pasta chips. 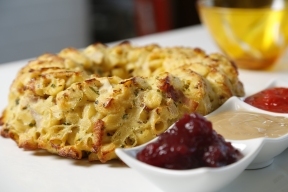 Pair with your favorite dip for a quick, delicious appetizer. Food is not just about the amazing flavors but also about appealing to the eye. Make your holiday pasta dishes Instagram worthy by garnishing them with fresh basil, parsley or cilantro and a touch of shaved parmesan. 4. Turn the oven on to 420F, and bake the bundt until it gets slightly brown around the edges, about 30 minutes. 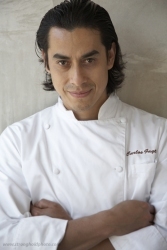 Carlos Gaytan is the executive chef and owner of Mexique restaurant located on Chicago Avenue, former Top Chef contestant, and member of the Pasta Advisory Council, part of Passion for Pasta.